In defiance of the shift away from blogs and towards the micro-blogging format of social media On An Overgrown Path recorded a modest increase in readership during 2017. Of particular significance are the trends within that remarkably resilient readership and two of these trends in particular are worth highlighting. The first is that social media exposure by the online classical tastemakers now has only minimal impact on readership numbers for my posts. In the world of classical music, Facebook, Twitter and other social media platforms have become a closed loop where the same people say the same things to each other many times a day and every day. These social media addicts have not noticed that the rest of the world outside the loop is not listening and not interested. The second significant trend is that an important part of the Overgrown Path readership now comes from beyond the classical closed loop. Recent widely read posts such as Classical music's biggest problem is that no one cares, There is a fine line between acoustic excellence and elitism, and What price a new concert hall? have attracted a large readership from professionals on the periphery of classical music in technology companies, acoustic consultancies and architectural practices. These are professionals who have no interest in the background noise of closed loops, but who see that set and setting and not celebrity is crucial to the future of classical music. Classical music's great gift is to, in many different ways, enhance consciousness. Set and setting is the term used to describe the context of psychoactive consciousness-changing experiences. 'Set' is an abbreviation for mindset, while 'setting' refers to the physical and social environment in which the experience takes place. It is only too obvious that the incestuous closed loop at the centre of the classical music industry is fixated on celebrity and not set and setting. Whether we like it or not, Norman Lebrecht's Slipped Disc blog is an accurate measure of the pulse of the classical industry, because it receives the unqualified support of musicians, record labels and orchestras. At the time of writing sixteen of the twenty most recent Slipped Disc posts are about classical celebrities, while three of the others are updates on long-running celebrity-related scandals. Which means that using this measure classical music's priority is 95% celebrities and their dalliances. There was not one story about the setting of the music; not one story is about the physical, virtual, or social environments in which the music is heard. But for once let's not blame Norman. Slipped Disc's readership is supposedly large, and these are the stories that the readers in the closed loop want, so these are the stories the classical industry is producing. Classical music's core problem is its inability to see further than its own celebrity-fixated closed loop. The past two decades have seen seismic shifts in consumer behaviour and tastes which have triggered dramatic changes in the way music is consumed. Those seismic shifts have all centred on set and setting, specifically the technological and physical changes triggered by digital technologies and mobile computing. Yet classical music remains fixated on celebrities, and its only concession to set and setting is the building of gobsmackingly expensive new concert halls based on 19th century conventions and designed to showcase celebrities. The ongoing uproar triggered by allegations of inappropriate behaviour away from the concert hall suggests that the concept of the classical celebrity has passed its sell-by date. We should not forget that crucial decisions on music funding and infrastructure are made outside the classical closed loop by policy-makers less obsessed by celebrities and more interested in the changing physical, virtual and social environments in which music is consumed. In view of this the current strategy of lavishing so much attention on classical celebrities and their dalliances is clearly unwise. 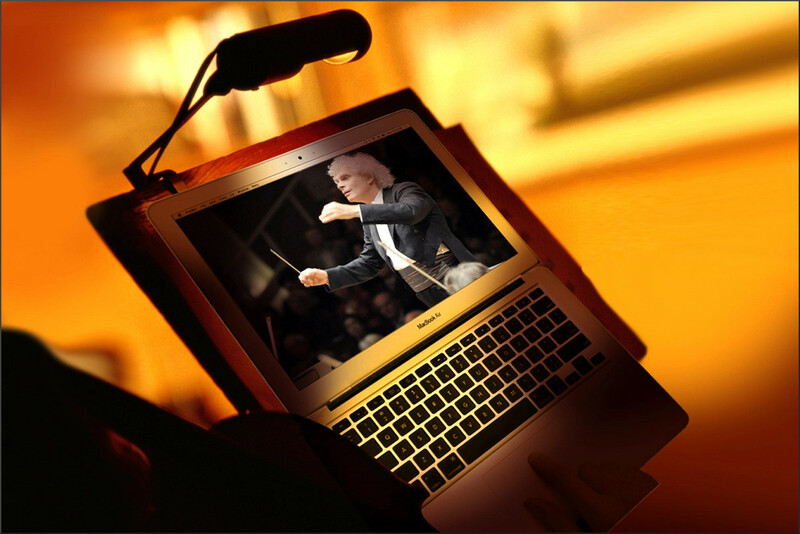 Header photo comes via Berliner Philharmoniker's Digital Concert Hall, a commendable initiative which tackles the imbalance between celebrity and technology setting. Any copyrighted material is included as "fair use" for critical analysis only, and will be removed at the request of copyright owner(s). Also on Facebook and Twitter. I find it most interesting that Lebrecht sees you as his "enemy" rather than "competitor" or someone who's "critical" of his behavior and methods. Certainly a good indicator of his mentality. Hank, yes I noticed that too. Probably best not to rise to the bait though.Thanks for your support and have a great festive season.